Criminal complaint for Consuelo Guerra-Guzman. McALLEN — A Mexican national who lied to U.S. Customs and Border Protection officers about needing to enter the United States because of a family emergency now faces life in prison after pleading guilty Wednesday to importing a controlled substance. Consuelo Guerra-Guzman, 47, was arrested on April 19 after a secondary inspection at the Pharr-Reynosa port of entry led to the discovery of more than 20 kilos of cocaine hidden within her 2003 Honda Accord, the complaint against her states. She had apparently aroused suspicion when sharing a familiar story with CBP officers, who hear hundreds of reasons why people are traveling into the United States on any given day, about needing to enter the country to visit her niece who was in the hospital with cancer. Guerra-Guzman called it “an emergency,” court records show. But this particular emergency sounded familiar to one CBP officer, who recalled hearing “the exact same story” from the woman on a previous occasion. Guzman-Guerra, who was driving the Accord up to the port of entry at the Pharr-Reynosa International Bridge, declared that she did not have any bulk cash, or illegal narcotics within the vehicle, when she told the CBP officer the story about a cancer-stricken niece. When confronted by the CBP officer about her story, Guerra-Guzman hesitated before stating it was for her niece’s admittance into the hospital — but by this time the officer referred the woman’s vehicle for a secondary inspection. During the inspection, officers discovered anomalies near the gas tank area of the vehicle, and subsequently found bundles of what was later determined to be cocaine, the court file states. In total, officers seized 20.44 kilos of cocaine from within the gas tank of Guerra-Guzman’s vehicle. During her interview with authorities, the woman admitted she was promised $2,000 in exchange for her transporting the cocaine into the country. 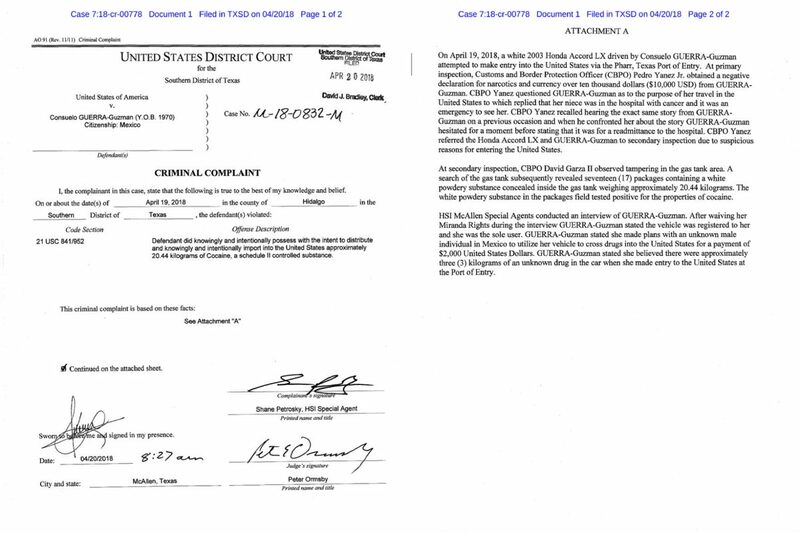 “Guerra-Guzman stated she made plans with an unknown male individual in Mexico to utilize her vehicle to cross drugs into the United States for a payment of $2,000,” the complaint states. Sentencing for the woman is scheduled for Oct. 11, 2018, where she could receive between 10 years to life in prison.